(Beauty grows in you to the extent that love grows, because charity itself is the soul’s beauty. — Ary Scheffer, 1854. Oil on canvas. 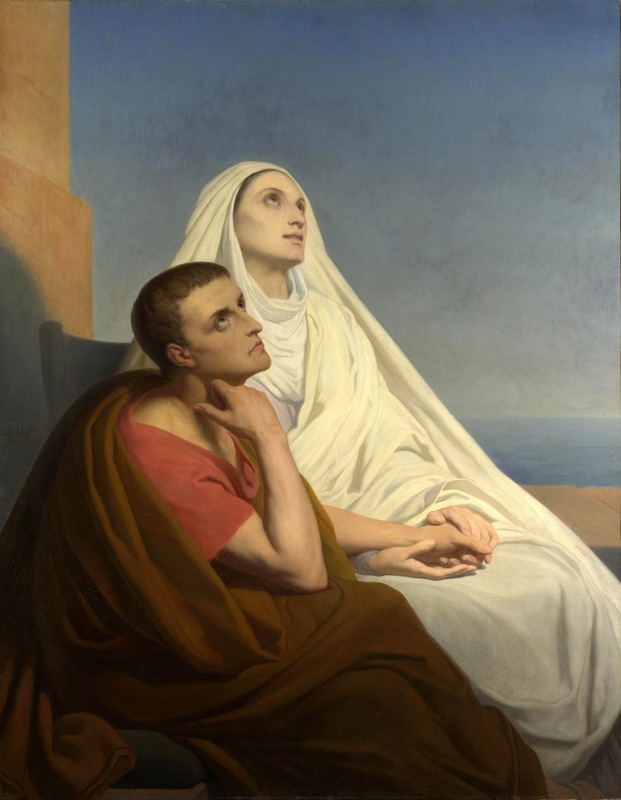 Saint Augustine and his mother Saint Monica discussing the Kingdom of Heaven shortly before her death. (13 November 354 – 28 August 430) was a Roman African, early Christian theologian and philosopher from Numidia whose writings influenced the development of Western Christianity and Western philosophy. He was the bishop of Hippo Regius in north Africa and is viewed as one of the most important Church Fathers in Western Christianity for his writings in the Patristic Period. Among his most important works are The City of God, On Christian Doctrine and Confessions. The great St. Augustine’s life is unfolded to us in documents of unrivaled richness, and of no great character of ancient times have we information comparable to that contained in the “Confessions”, which relate the touching story of his soul, the “Retractations,” which give the history of his mind, and the “Life of Augustine,” written by his friend Possidius, telling of the saint’s apostolate.